We've selected some of our favorite sci-fi and fantasy novels. If you are new to these genres we encourage you to dive in and enjoy one of these fantastic novels. Cat Valente is revered among fantasy writers for her vivid imagination and her beautifully wrought sentences. She has developed a cult following among lit fiction writers as well and is beginning to have a well deserved cross-genre readership. In this novel, Palimpsest is a city beyond the end of the world where four travelers—Oleg, a New York locksmith; the beekeeper November; Ludovico, a binder of rare books; and a young Japanese woman named Sei—converge, each looking for something they have lost. We think it’s a great introduction to her work. This is the first in the Jon & Lobo series and is the story of Jon Moore, a retired warrior enhanced with nano-technology within his body, and his partner, Lobo, an artificially intelligent ship complete with a personality that more than occasionally irks Jon. The plot involves two mega-corporations battling for control of a planet’s “jump-gate.” There are 5 books in the series, but some consider the fifth, No Going Back, to be the best. This book was first published in the UK in 2012 to wide acclaim. This new edition, from Vintage Original, will be published this spring. The story follows an English soldier who will be the first human to ever explore the Vorrh, an endless forest of demons, angels, warriors and priests. Iain Sinclair says of the the book, "There are not many books that rearrange the molecules of your being, turning your eyes inside out. The Vorrh, this saturnine post-traumatic testament, is one of them. A work of genius." Catling will be appearing at The Center on Wednesday April 29. Click here for more information on the event or to RSVP. Pettersson gives a fresh, fun take on a noir mystery blended with urban fantasy and a love story. Grif Shaw is a Centurion, an angel who helps souls cross into the Everlast, especially those who died violently—just as he did fifty years ago. One day he comes to collect a soul and inadvertently puts another life in jeopardy. Now Grif must interfere with mortal events and help Kit Craig, a newspaper reporter who lives the rockabilly lifestyle. Together Grif and Kit track down who is kidnapping young women and forcing them into prostitution, and it looks like the culprits may be some of Las Vegas’ most powerful movers and shakers. 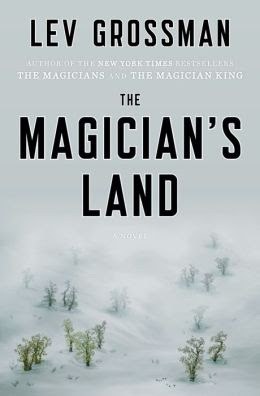 This is the last book in the New York Times bestselling Magicians trilogy by Lev Grossman. The trilogy follows Quentin Coldwater, a student of Brakebills Preparatory College of Magic who must fight to save Fillory, a secret magical land that he once ruled. Here's what Edan Lepucki of The New York Times Book Review has to say about it: "The strongest book in Grossman’s series. It not only offers a satisfying conclusion to Quentin Coldwater’s quests, earthly and otherwise, but also considers complex questions about identity and selfhood as profound as they are entertaining." A combination of fantasy novel and police procedural, this is one of acclaimed fantasy writer Miéville’s best books—and one of his shortest. It takes place in the cities of Besźel and Ul Qoma. These two cities actually occupy much of the same geographical space, but are perceived as two different cities. A denizen of one city must dutifully 'unsee' buildings, and events taking place in the other city—even if they are an inch away. Residents of the cities are taught from childhood to recognize things belonging to the other city without actually seeing them. Ignoring the separation, even by accident, is called "breaching"—a terrible crime by the citizens of the two cities, even worse than murder. Jack and Mabel begin drifting apart when they move to Alaska. They are both unable to deal with the hardships they face in the harsh, lonely climate. One night in a brief moment of levity, the couple builds a child out of snow in the first snowfall. The next morning the snow has melted, but a young child remains, sprinting through the trees. As Jack and Mabel struggle to understand the circumstances of the child’s existence, they gradually come to love her as their own. This is a wonderful, modern take on the fairy tale. Part fantasy and part mystery, The Queen of the Tearling is the epic story of Kelsea, a young princess that must reclaim her mother’s throne and defeat a malevolent sorceress who is determined to destroy her. As she takes the place of her vain and frivolous mother as queen, Kelsea must quickly decide whom amongst her she can trust, all while dodging the attacks of those who want her deposed. This is a wonderful debut by Erika Johansen. Get in on the ground floor and expect more great fantasy to come! Essun, a woman living an ordinary life in a small town comes home to find the every part of her world has changed. Her husband has murdered her son and kidnapped their daughter, the world spanning empire that has ruled for a thousand years has collapsed, and a great red rift has split across the land, spewing ash that is darkening the sky. Undeterred by the deteriorating world around her, Essun will do anything and everything she must to get her daughter back. Jemisin is a promising young writer who during her short career, has already been nominated for a Hugo Award. The Fifth Season is her newest and it comes out in August.